Congress has received notification of a potential $3 billon sale of 17 Bell-Boeing V-22 Osprey tilt-rotor aircraft and support equipment to Japan, according to a Tuesday announcement from the U.S. Defense Security Cooperation Agency. In its statement, DSCA (pronounced dis-kah) said the potential sale would expand the ability of the Japanese Self Defense Forces (JSDF) to operate more closely with the U.S. and extend the range of their ground forces. “Japan is modernizing its transport fleet to better support its defense and special mission needs. The proposed sale of V-22B Block C Osprey aircraft will greatly enhance the Japan Ground Self-Defense Force’s humanitarian and disaster relief capabilities and support amphibious operations,” read the DSCA statement. The agency notified Congress of the possible sale on Tuesday. In addition to the Osprey’s the deal’s outline would also include night vision goggles, a variety of radars, spare parts and training equipment. Japan has been considering the buy at least since 2013 with 17 Osprey’s planned for as part of the country’s five-year mid-term defense program update as part of an emerging amphibious capability modeled on the U.S. Marine Corps, according to a January report in Flight Global. Ospreys are key to the U.S Marine Corps posture in Western Pacific thanks tho their ability to fly further and faster than traditional helicopters and still land on a variety of ships. 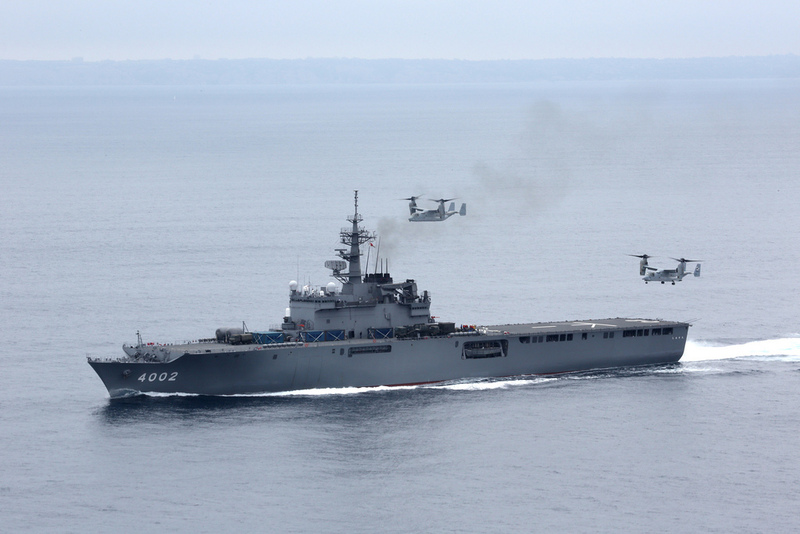 For it’s part, Japan has commissioned the first of two Izumo-class large helicopter carriers that would make ideal launching platforms for the V-22s. U.S. Marines have also successfully tested V-22s on the onboard Japan’s Hyuga-class DDHs in 2013. The announcement of the potential sale follows closely with a revision of U.S.-Japan guidelines that allow Japan and the U.S. closer operations. Unlike domestic defense programs, U.S. foreign military sales undergo a much more circuitous acquisition process. Congress now has the option to approve the concept of the sale and Japan has to agree to the terms before companies can agree to final terms and delivery dates, according a State Department official told USNI News on Tuesday. Officials at Bell-Boeing did not immediately respond to USNI News for a request for comment.